Dams profoundly impact the geomorphology of rivers by altering the natural patterns of water, sediment and energy flow in rivers. These changes have a largely negative impact on aquatic and riparian ecosystems upstream and downstream of the dam. Natural dams also impact river geomorphology, although with positive and negative repercussions for aquatic and riparian organisms. 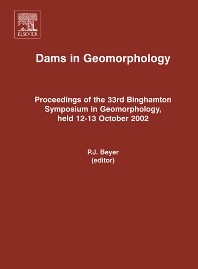 In 2002, the 33rd Binghamton Geomorphology Symposium convened under the theme "Dams and Morphology," and featured invited papers and contributed posters on topics of natural dams, artificial dams, and dam removal. Fourteen of these papers have been included in this volume. Introduction. 1. Geomorphology and American dams: the scientific, social and economic context (W.L. Graf). 2. Dams and geomorphology: Research progress and future directions (G.E. Petts, A.M. Gurnell). 3. The geomorphic influences of beaver dams and failures of beaver dams (D.R. Butler, G.P. Malanson). 4. Changes in hydrologic regime by dams (F.J. Magilligan, K.H. Nislow). 5. Effects of Jackson Lake dam on the Snake River and its floodplain, Grand Teton National Park, Wyoming, USA (R.A. Marston, J.D. Mills, et al.). 6. The roelof impoundments in the sediment budget of the conterminous United States (W.H. Renwick, S.V. Smith, J.D. Bartley, R.W. Buddermeier). 7. Dams, sediment sources and reservoir silting in Romania (R. Radoane, N. Radoane). 8. Floodplain-river ecosystems: Fragmentation and water resources development (M.C. Thoms, M. Southwell, H.M. McGinnes). 9. Statistical analysis of lateral mirgation of the Rio Grande, New Mexico (G.A. Richard, P.Y. Julien, D.C. Baird). 10. Equilibrium or indeterminate? Where sediment budgets fail: Sediment mass balance and adjustment of channel form, Green River downstream from Flaming Gorge Dam, Utah and Colorado (P.E. Grams, J.C. Schmidt). 11. Potential sedimentation impacts related to dam removal: Icicle Creek, Washington, U.S.A. (M.S. Lorang, G. Aggett). 12. Sediment from hydraulic mining detained by Englebright and small dams in the Yuba basin (L.A. James). 13. Stream ecosystem response to small dam removal: Lesson from the Heartland (M.W.Doyle, E.H. Stanley, et al.). 14. The evolution of gravel bed channels after dam removal: Case study of the Anaconda and Union Dam removals (L.A.S. Wildman, J.G. MacBroom).